Michelangelo's statue David has been unveiled in Florence, Italy, after the 500-year-old work underwent a painstaking clean-up process. Almost a year has been spent removing grime and sulphate deposits using distilled water and cellulose. The restoration had drawn criticism from art-lovers who feared the statue could be damaged during cleaning. The work was undertaken in full view of the public at the statue's home at the Galleria dell Accademia in Florence. The restorer first appointed to the project resigned after declaring only dry brushes should be used and the grime build-up added to its character. But gallery director Franca Falletti said brushing alone would not have gone far enough and using water would return David to the icon of eternal youth that Michelangelo intended. 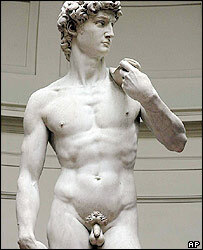 "David is still itself, only what has changed is his luminosity," said restorer Cinzia Parnigoni. Ms Falletti said David would now be examined and dusted eight times a year. The masterpiece, which celebrates its 500th birthday in 2004, attracts more than 1.2 million people to the gallery every year. The cleaning process revealed the statue, which weighs six tonnes, showed signs of stress around the ankles. There are now plans for a team of engineers to look at how to stabilise the statue for the future. The five-metre statue, hewed from a single block of marble, has faced tougher tests than cleaning in its chequered history. It was commissioned by the Florence guild of wool merchants in 1501 and spent centuries in the Piazza della Signoria square, being buffeted by the elements. It was damaged during a riot 1527 and in 1843 it was cleaned using chloric acid. It was moved to its more protected location in the city's Galleria dell Accademia in 1873 but in 1991 an Italian painter took to it with a hammer and smashed off a toe on the left foot.